For many years, tattoos have been used in advertising to promote and sell a variety of products. Tattoos are seen in advertisements selling Marlboro and Silk Cut cigarettes, and used by such corporations as the Sony Company and the Coca-Cola Company in both their print and television advertisements. The oldest example in the Archive's collection is an advertisement for Phenol Sodique, This product was guaranteed to stop bleeding and heal all wounds. The ad depicts tattooed sailors having breakfast on the deck of the warship Olympia. Although the battle rages in the distance, and the sailors are wounded, they smile as they drink their coffee because they have Phenol Sodique! This dates from the Battle of Manila Bay in 1898. The late Frank Howard reminisced that he once tattooed a man with a panorama of pictures showing a cigar store. This man exhibited himself at fairs to promote the cigar store. Possibly the first large American company to use tattoos in their advertising was the Coca-Cola Company. This advertisement featured an Army Sergeant showing his eagle chest piece to a tattooed Maori chief while they both enjoyed a Coke. Another advertisement showed a shipyard scene where a tattooed workman shared a Coke with a Rosie the Riveter type. Perhaps one of the largest advertising campaigns to ever use tattooing as a way to advertise and sell their product was for Marlboro cigarettes. In 1956 the makers of Marlboro, whose sales were beginning to sag, set out to change the image of the typical Marlboro smoker. The firm of Leo Burnett Inc. was brought in to accomplish this. Up until this time, Marlboro cigarettes had been known as a woman's smoke. Burnett's idea was to feature rugged tattooed men in an effort to create a new market for their cigarette. You can be the judge as to whether or not this advertising was a success! 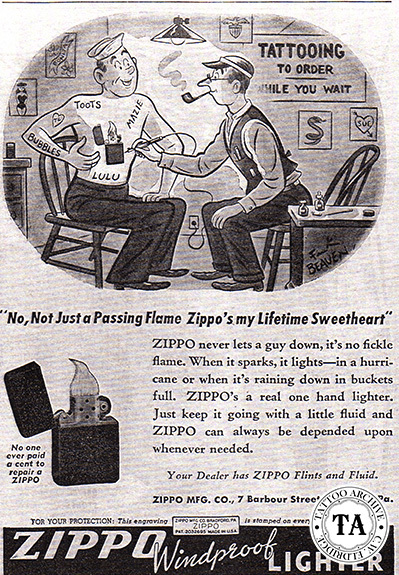 The print ads showed men, mostly with military tattoos on the backs of their hand, posing with a cigarette. These tattoos were simply painted on. This advertisement alone resulted in hundreds of letters from men wanting to pose as a Marlboro Man. In the 1970s, the Sony Company ran ads for their small pocket transistor radios. These advertisements featured the radio slung over the shoulder of a heavily tattooed member of the Tattoo Club of Japan. Unlike the Marlboro ads of the 1950s, the Sony ads depicted real tattoos.